Our January 2019 Artifact of the Month is a unusual, primitive Princeton-style head harness by an unknown manufacturer. Insufficient evidence has previously existed to definitively rule this artifact as a football head protector. Not only does this style helmet not appear in any manufacturers' catalogs, no photographs had been known to exist showing it worn by a football player. 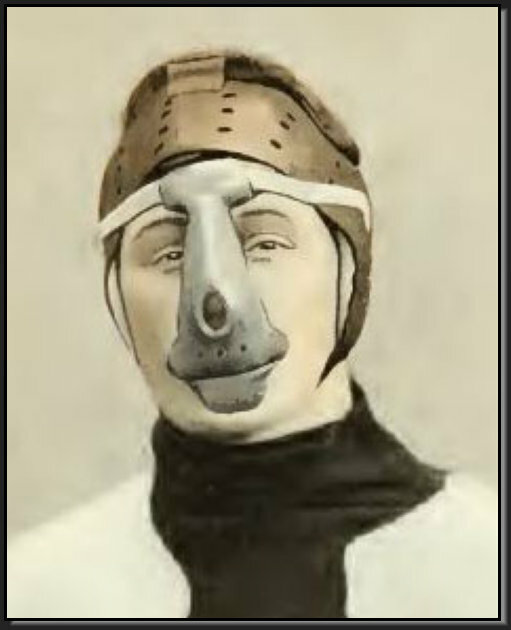 However, a recently discovered image from a 1905 French periodical may help support the conclusion that the helmet is indeed a turn-of-the-century football head harness. Our primitive head harness utilizes the 4-point attachment design, but with construction materials and techniques that predate those used in Princeton-style football helmets of the 1910's. Thin and flexible, the exterior shell of the head harness would provide minimal impact protection to the front, sides and rear of the head. Instead, similar to late 1890's head protection, the harness appears to have been designed to protect only the ears and the crown of the head and to prevent hair pulling. The only padding provided are two donut-shaped, hair-stuffed ear pads and a hair-filled crown pad. The harness body has ventilation holes punched throughout, with the exception of the forehead, which looks to have been repaired and replaced with a non-perforated piece of leather. It's possible that the harness wasn't designed for football, but may be an early aviator, wrestling, bicycle, or motorcycle helmet. This could explain why no images of this style football helmet were previously known to exist. Made popular as the style worn by Princeton University in the 1910's, the Princeton-style head harness was a lightweight leather helmet designed to maximize air flow to the head. It consisted of a separate flat top attached to the body of the harness at 4 points. The Princeton-style was first mass produced between 1912 and 1924. Different versions of the Princeton-style were sold by Reach, Spalding, Wright & Ditson and Rawlings, each utilizing the same 4 point attachment concept. Production of the Princeton-style stopped in the mid-1920's as players opted for more protective and rigid molded helmets. I will not describe the game, I would not be able to, for, from the first signal, it is impossible to see anything else on the field except curved backs, stiffened legs, hands held up and crisped like a precious prey; then, when the ball is thrown, a frenzied scramble occurs, one pulls the legs of the opponent who falls hard, rises immediately, unless it is crushed by the mass of those who fight on his body. If by chance one of the champions manages to get out with the ball and run away, it's a frightening race! We throw ourselves on the ground in front of him, and we see him staggering, falling down, always holding the ball in his arms like a dear child. Or else, if he escapes this carnival ride, other hands grip him through the head, the bust, the legs, the feet, until he is lying on the ground. But during this time, those of his camp do not remain inactive: they rush on those who want to oppose the passage of the ball carrier on, jostle them, repel them, and it is then a general melee, prodigious, impossible to follow, so fast, ardent and multiform. The enthusiasm of the public underlines each episode of the fight; student cries powerful and rhythmic fill the air, and I assure you that we do not think to laugh or joke. We breathe an electric atmosphere, saturated with strength and energy. And the show of the crowd is beautiful. All the necks are stretched towards the lawn, the eyes shine with battle ardor, the fingers clench on the balustrades, the fists close, and I have heard, at a serious moment in the struggle, a student shouted, "Kill him! Break his neck!" I turned around and looked at this sweet apostle. He was a young man of nineteen to twenty, brown, beardless, proper; his eyes gleamed with an acute flame between his frowning eyebrows; his teeth were tight and his jaws protruded more. I know they were just words, and he was not himself a murderer. But, all the same, a game of or emanating such brutal frenzy of wrestling can not be good for civilization. Opinions, moreover, are shared in America on the moral value of football. Some want to suppress it, others refuse it. I believe, however, that no one will argue that it is developing gentleness and goodness. But, on the other hand, it prodigiously cultivates the strength of resistance and the fighting spirit. I do not think the wickedness last. The finished part, these young people remain friends, like fencers after an assault. Even at the beginning of the game, Yale greets Harvard, and Harvard greets Yale with three long welcome greetings. I could see these wrestlers close. With the heads of young Romans, they certainly do not look like lambs. Their prominent chins and jaws, their short, cold looks, their shoulders, their arms and chest muscles, their thick hands are not evangelists, and when they come into life they will be formidable competitors for the assault. There is, in the expression of these heads of righteousness, courage and sangfroid, and if football is able to develop for these qualities, it seems to me that it is defensible. In any case, it passionately thrills the American people. You have to see and hear the crowd when one side is about to win! When the decisive blow is prepared in front of the favorite team, anticipation builds until the crowd erupts with applause and cheers. Forty thousand breasts scream or sing the students' wars of war, the next rhythmic eras, alternating energetic songs, songs of battle and victory, sings with a marvelous ensemble that increases its effect. From time to time, one of the stars falls and stays on the ground: a bad blow has been given. We hurry around him; a doctor runs across the grass, a helper brings a bucket of water and a sponge; one sprinkles a figure, the doctor pulls and shakes an armhalf or mass quickly fingers, and the game soon resumed: the wounded wanting to continue. We see who limps and who refuse to be replaced. After a fight that is more terrible than the others, I see one of Yale 's blue stars, who falls while holding his head in both hands. The blow is too serious probably, because he lets himself be carried away, amidst frenetic cheers. Another blue, a substitute ready to go, took his place, pawing with joy. After three hours of hard struggle, Yale is victorious: he won by 22 points to 0, which is a triumph. The defeat of Harvard proves that while everyone wants to stand out for himself, to shine, to be a star, at Yale perfect discipline is observed, and that the rule is the no individual is more important than the team. I leave the stand at the sound of fierce clamor, which still linger long after dark." "A football player. Football, as it is practiced in the United States, is an extremely brutal game that forces the participants to protect their head, mouth and nose with a molded leather helmet." The leather helmet worn by the turn-of-the-century player in Plate 85 bears many similarities with our head harness. Both utilize a separate, padded crown piece attached to the helmet body with leather straps. They also possess circular perforations throughout the leather, and similar ear pad geometry and chinstrap. The L'Amerique Moderne image provides evidence that the Princeton-style football helmet was utilized prior to the mid-1910's, the commonly excepted start of its use, and that our example is likely a turn-of-the-century football head harness. The following is a translation of the chapter "La Football" in "L'Amerique Moderne," describing the spectacle of turn-of-the-century American football. Some sentences have been shortened or deleted due to translation incoherence. Brekekekex ! - Koex I koex ! Brekekekex ! - Koex ! koex ! Imagine ten thousand, twenty thousand strong throats chanting eight times that cry under the free sky, like drumbeats of drumming drums, able, under the rhythmic baton of a choral leader! It is scary of power and energy and all the time that will last the game, these same cheers, exchanges from one end to the other of the stand, will accompany the games, will support and excite from their magnetism the courage of the wrestlers. I had the opportunity, later, to hear these songs again. It was, one evening, near many whiskeys. My young friends who sang them had tears in their eyes. In fact, I discover the emotion of everything reminiscent of childhood and the exaltation of young age. Everyone knows football today: two camps of eleven opponents who try, according to agreed rules, to send a big ball on the enemy camp. There are some famous football games in England, there are some beautiful ones in France that I have attended, but what I have seen is that it is as brutal as anything you can imagine.